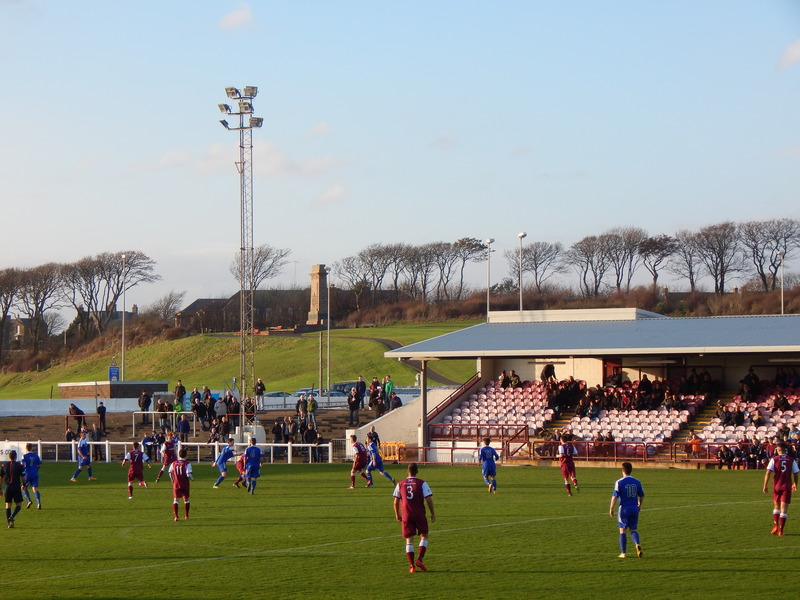 The remote Angus coastal burgh of Arbroath is famous for two reasons, the “smokie” a kiln smoked salted haddock and for the fact that the town’s football team hold the record for the biggest victory in senior football. 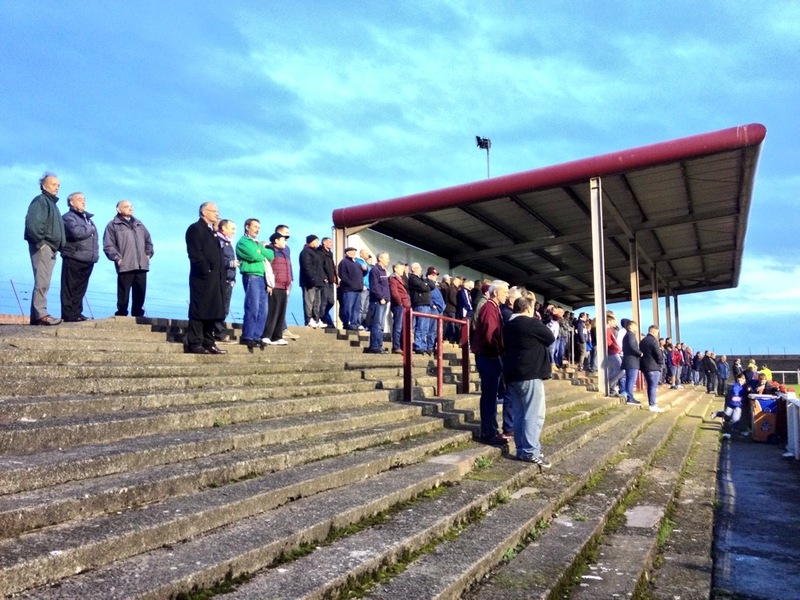 In September 1885 Arbroath defeated the hapless Bon Accord by an incredible score of 36-0. Arbroath forward Jocky Petrie helped himself to thirteen of the goals, itself an individual scoring record. Amazingly on the very same day Dundee Harp missed their chance of lasting fame by only racking up 35 unanswered goals against Aberdeen Rovers. 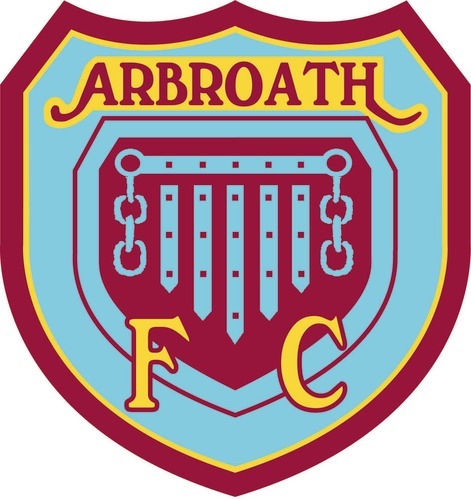 The club has the nickname of “the Red Lichties” which was derived from the red lights that were illuminated on the harbour front to safely guide the fishing boats back home. 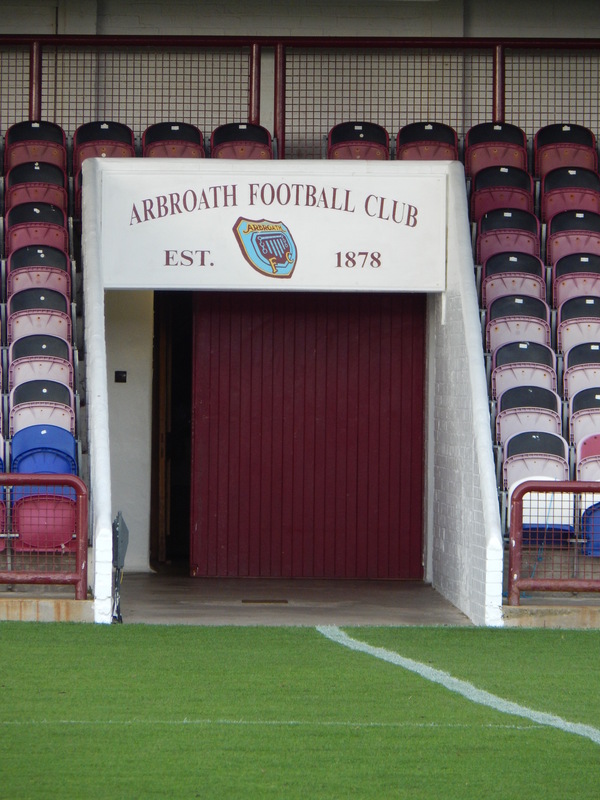 Arbroath were formed in 1878 and initially played on a basic pitch between the sea and the railway line. It was known as the Hospital Field. In 1880 the club moved to a new site which was called Old Gayfield. It was tightly hemmed in and on one side the external wall was yards from the touchline meaning spectators could not watch from that side. The first game at the ground was against Rob Roy. However, the new ground irked mighty Rangers who complained that “the back green” they had just lost on was too small for purpose. The Scottish FA acquiesced to their demands for a replay which the Glaswegians won 8-1. 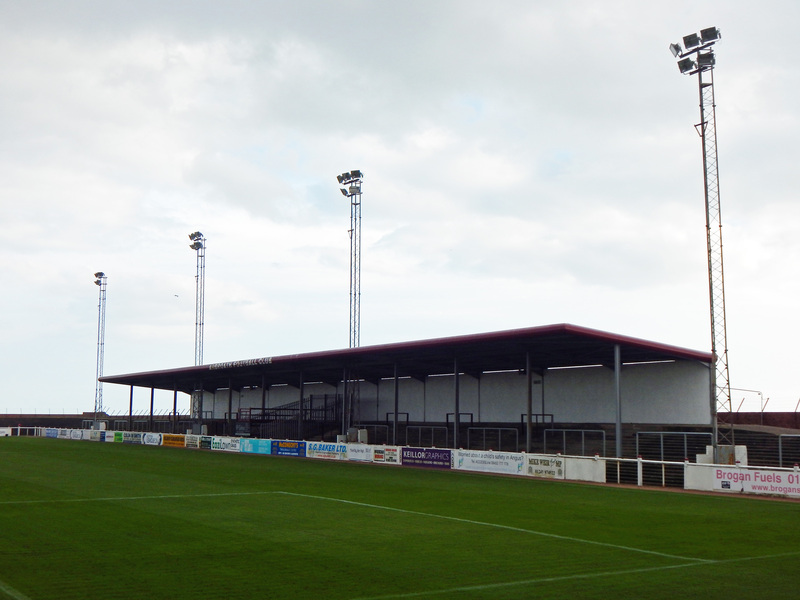 Old Gayfield was subsequently enlarged with the acquisition of seashore owned by the local railway company. The club played their last match at Old Gayfield in March 1925 against King’s Park before moving the ground around sixty yards south west. 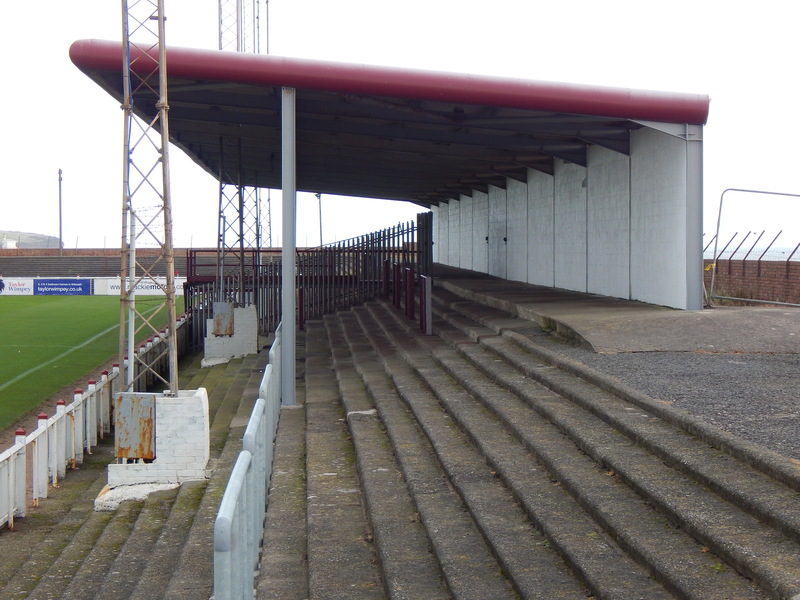 The old seaside stand was demolished and a new stand erected on the Dundee Road side of the new orientation of the ground now called Greater Gayfield. The ground was ready for the new season and 7,000 people packed in to see the Earl of Strathmore declare the venue open before a game against East Fife. In 1949 the record attendance of 13,510 was set at Gayfield when another visit from Rangers passed without complaint. The floodlights at Gayfield have a chequered history to say the least. 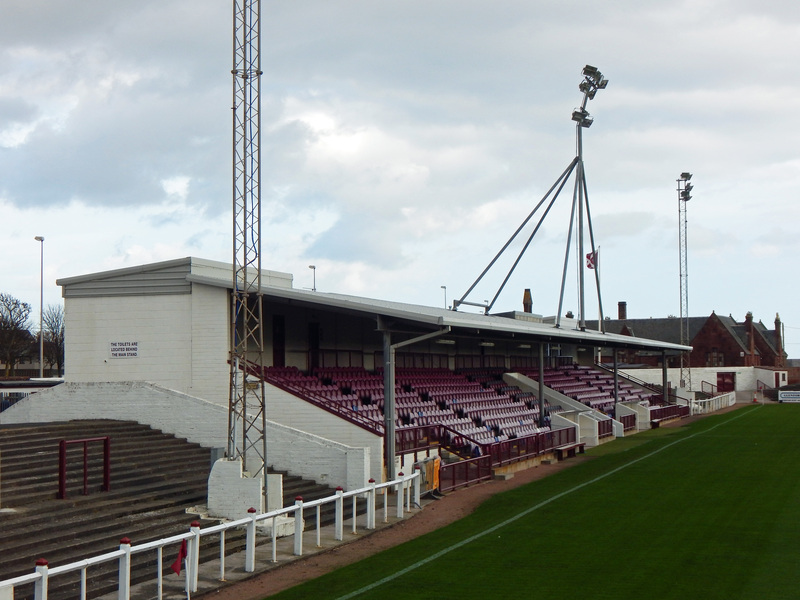 The first temporary set were erected in 1955 and in only their second game against Dundee United an Arbroath player caused much merriment by smashing one of the lights with a wayward boot of the ball. These were replaced with lights bought from Aberdeen in 1970 although sixteen years later they were sold on again to Eastwood Town. Gayfield survived a serious fire to the main stand in September 1958, the alarm being raised by Partick Thistle players lodging in the hotel opposite the ground. 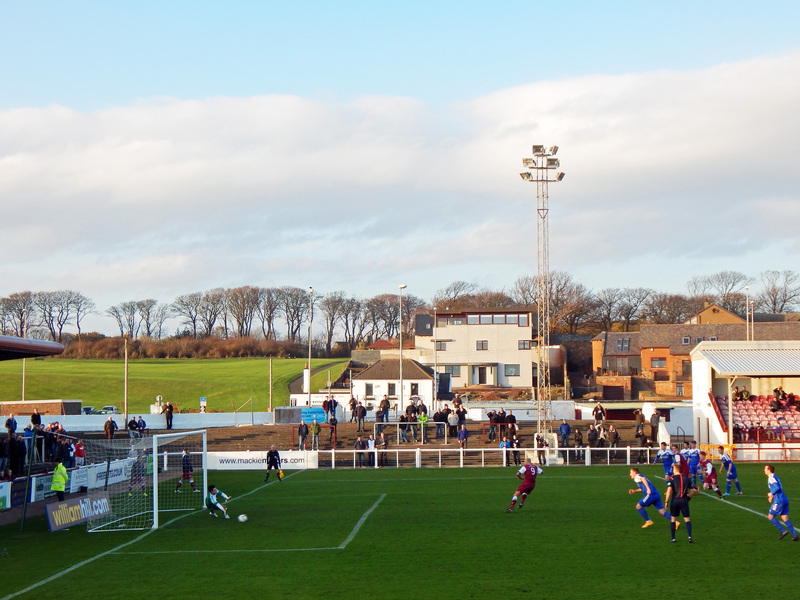 The old stand suffered significant damage and was replaced by the present brick and concrete structure. 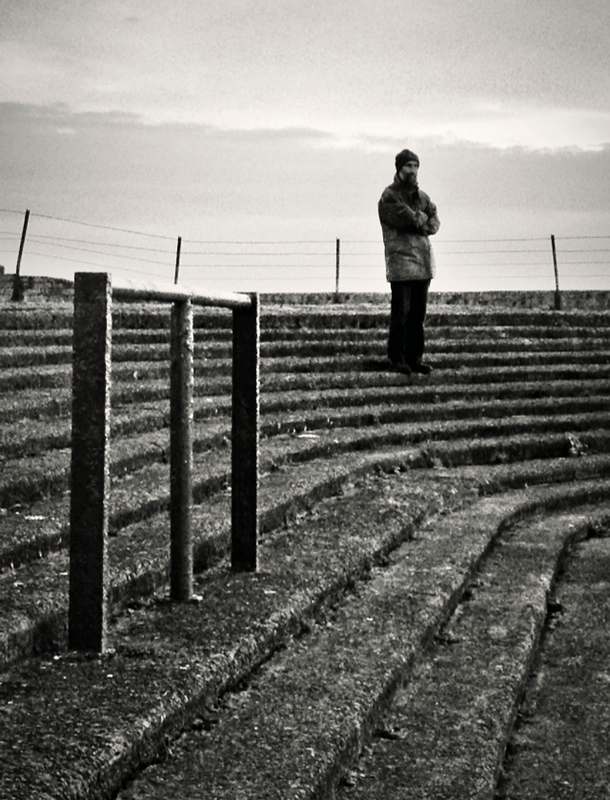 Two of the three covers were erected in 1979 and the fabled “seaside” stand was covered a year later. It truly must be the closest football stand to the sea in the land, both Gay Meadow and Craven Cottage being merely riverside rather than adjacent to the howling, elemental and endless North Sea. The word “bracing” somehow just doesn’t cut muster. Today’s game is played in a strong wind and fair light and Gayfield rocks to an early penalty kick which is comfortably dispatched by Paul McManus. The hosts failed to build on it though and only lead their Highland League visitors by a one goal margin at the turn around. 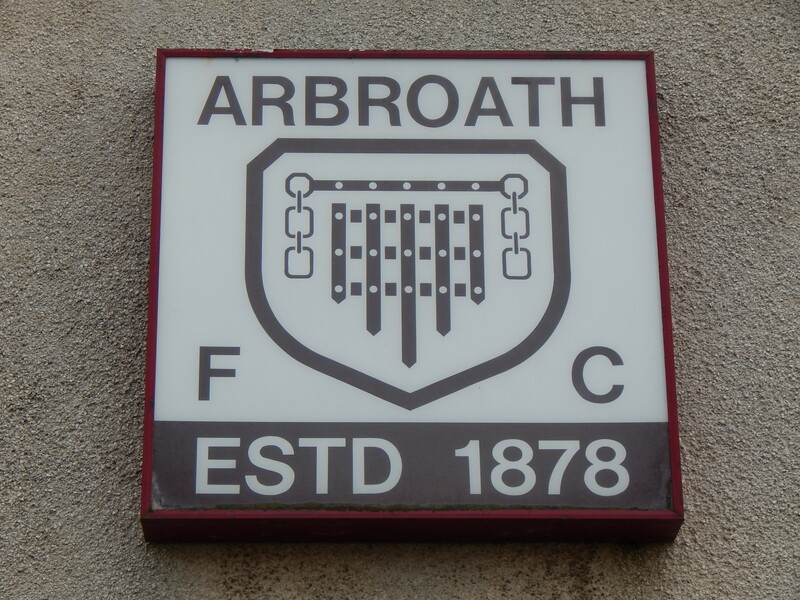 Arbroath double their lead when left back Scott McBride powers in an impressive header from a corner. Almost immediately after the restart there is concern for the home goalkeeper who was subject to a heavy but fair challenge. He is down for some five minutes receiving treatment and has to be replaced. As the sun sets over Gayfield it is the visitors of Nairn that push forward, Sean Webb reduces the arrears two minutes from time. There is of course lengthy stoppage time and Nairn pile on the pressure seeking to take the tie back to Station Park for a replay. 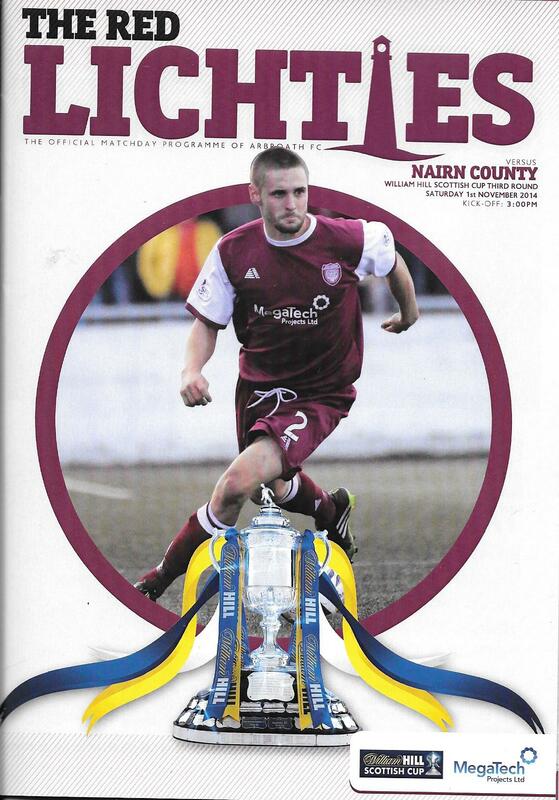 They can count themselves unlucky that the equaliser didn’t materialise and the Red Lichties held on for the victory. Gayfield is just glorious, there is no other word for it. Sweeping terraces and hefty covers built, no hewn, to withstand this unforgiving coast and its unrelenting wind, sea, salt and weather. This is visceral, primordial football not only do you have to outwit your opponent but you also have to do battle with the unpredictable elements. 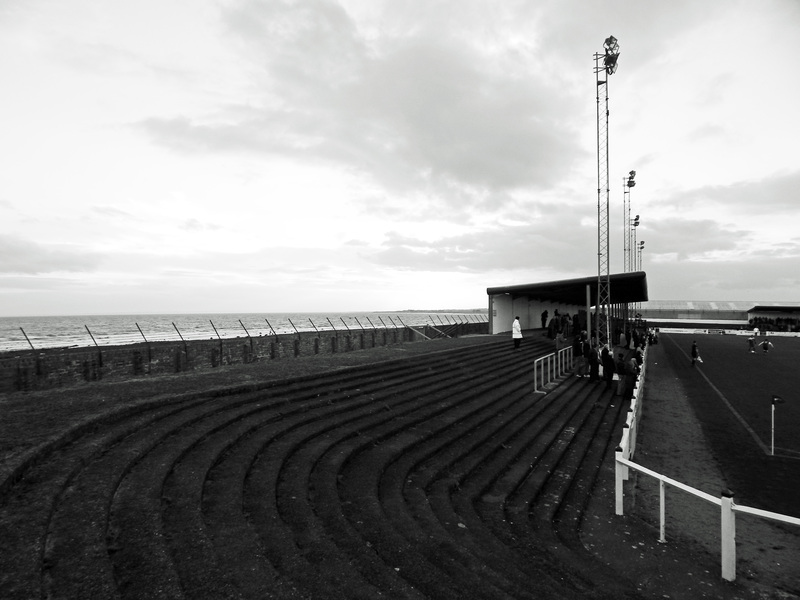 It’s not too glib to say this is an iconic lower league ground, ridiculously photogenic, all big skies and lucent light. I excitedly snapped photograph after photograph, until the red light indicated battery power down. This ground has a mythical feel to it, truly up there with the best grounds in the kingdom. 1. David Crawford, 2. Ricky Little, 3. Scott McBride, 4. Kevin Nicoll, 5. Aldin El-Zubaidi, 6. Mark Whatley, 7. Bobby Linn, 8. Keiran Stewart, 9. Paul McManus (c), 10. Simon Murray, 11. Jordan Lowdon. Subs: 12. Kevin Buchan (for 9,78 mins), 14. Michael Travis, 15. Johnny Lindsay, 16. Michael Wallace, 17. Connor Birse, 18. Craig Johnstone (for 11, 63 mins), 21. Scott Morrison (for 1,71 mins). 20. Callum Antell, 2. Sean Webb 3. Glenn Main, 4. Michael Morrison (c), 5. Martin MacDonald, 6. Wayne MacKintosh, 7. Bradley Halsman, 8. Alan Pollock, 9. Robert Duncanson, 10. Conor Gethins, 11. Kyle Wilkie. Subs: 1. Michael MacCallum, 12. Paul Macleod, 14. Ross Naismith (for 11,82 mins), 15. Sam Urquhart (for 9,73 mins), 16. Adam Naismith, 17. Chris Moir, 18. Matthew Murphy. 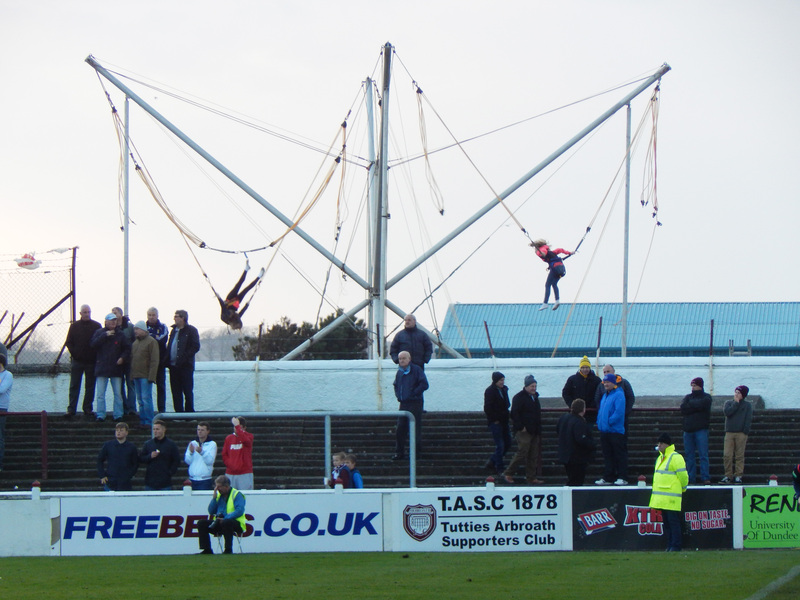 This entry was posted in Travel, Matches & Stadiums and tagged Arbroath, Bon Accord, Gayfield, groundhopping, Grounds, Nairn County, Scottish, Scottish League, Stadiums by peterrmiles. Bookmark the permalink. 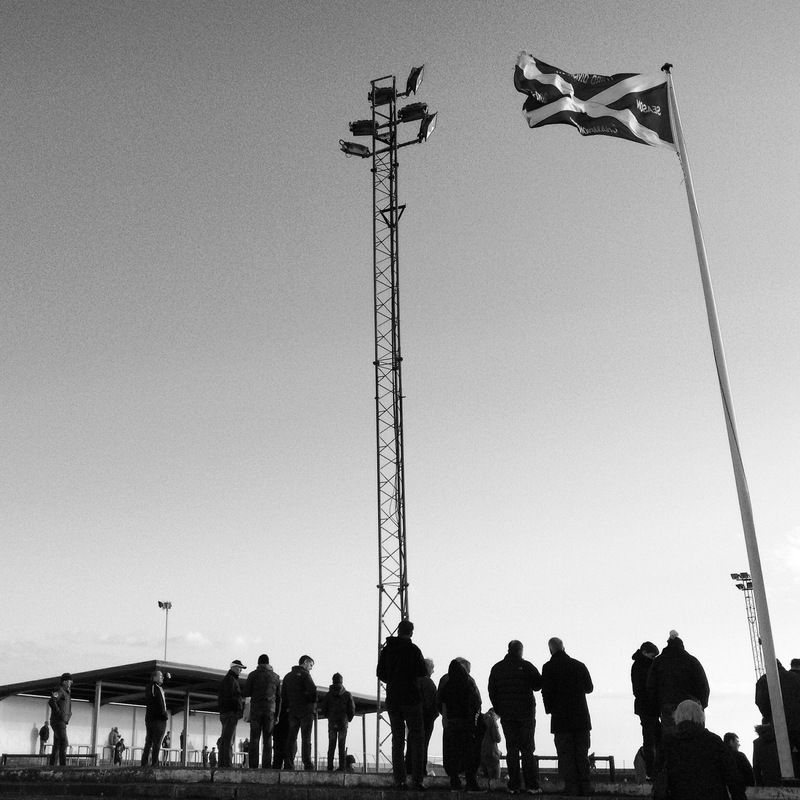 A wonderful piece and glad you enjoyed your time at arguably the coldest ground in the UK (the old away end at Oldham does run it close though!). 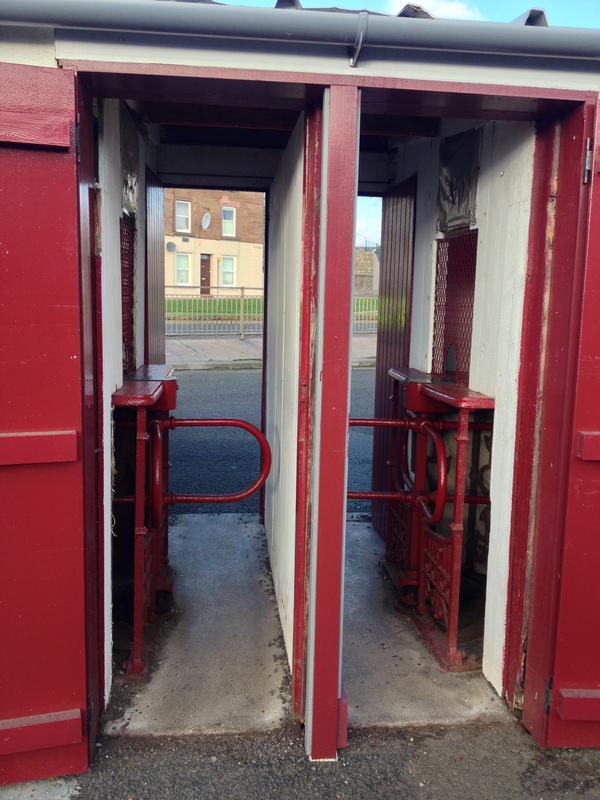 As an Everton fan in exile, I got myself an Arbroath season ticket a few years ago as they are my local club – even in the depths of winter when feeling has long been lost to the feet, it is a smashing ground with fantastic pies! Glad you enjoyed the piece. Loved it there. Looks a nice ground , enjoyed the write up , is tempted to go up . 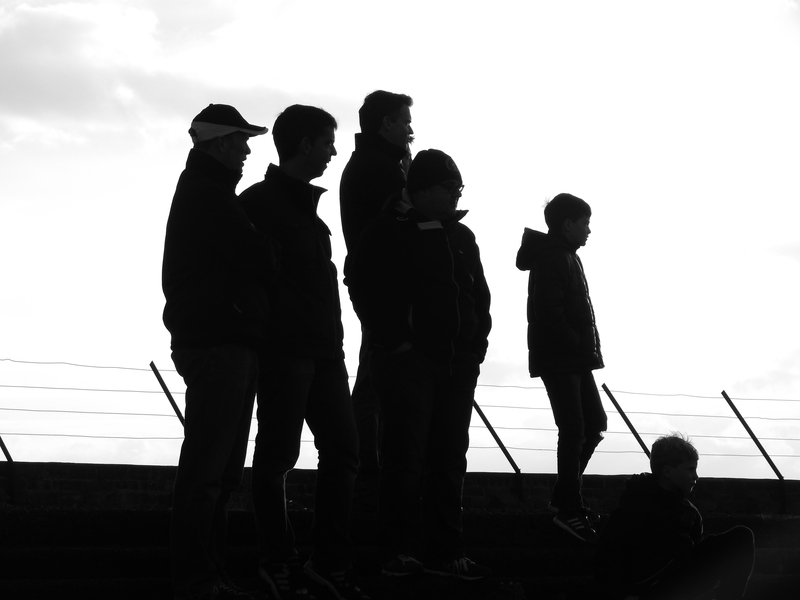 Great photographs, cracking stadium…I visited it in 2009-2010 on a cold weekday night. I look out for their results to this day. 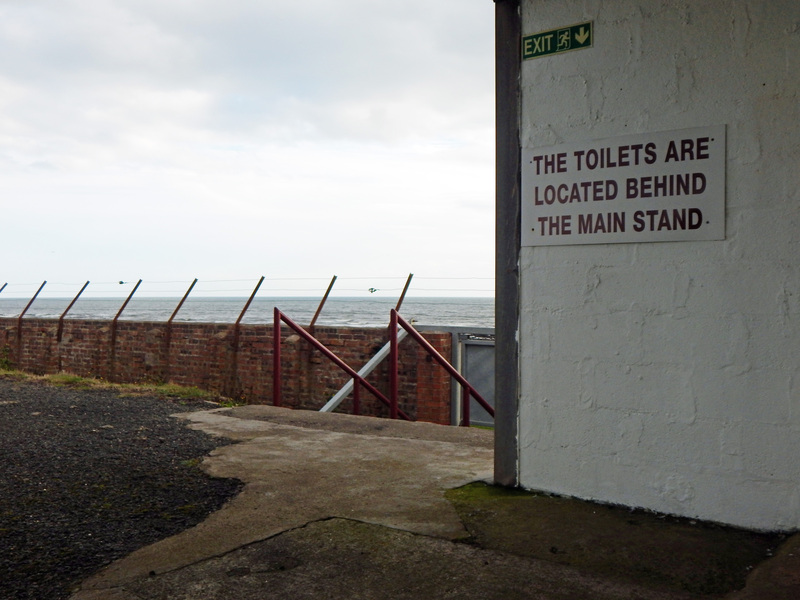 You get certain clubs like Arbroath that your retain an affinity and affection for long after you visit. 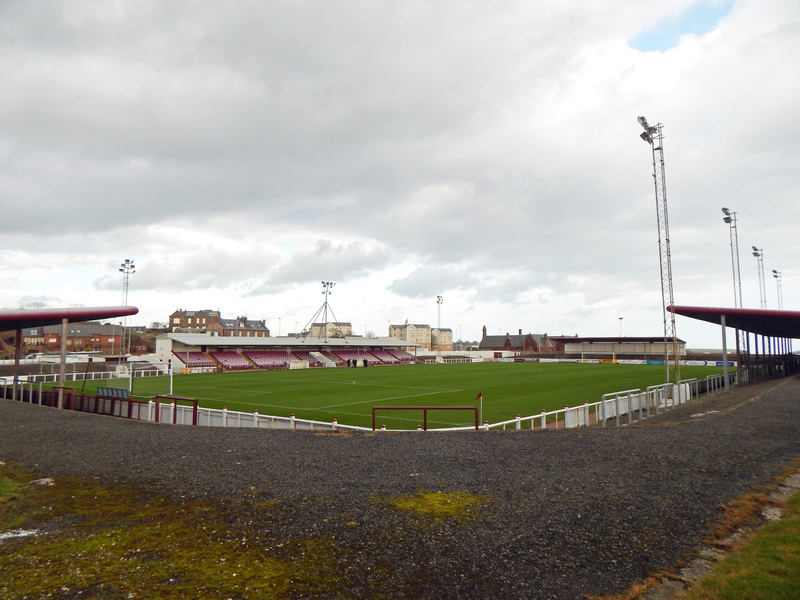 For the size of the town, Arbroath’s stadium surprised me. It’s terraces are surprisingly deep. I suppose that it stems from the days of the old two division scenario in Scotland, when any stadium needed to be large enough to house potential Old Firm visits.